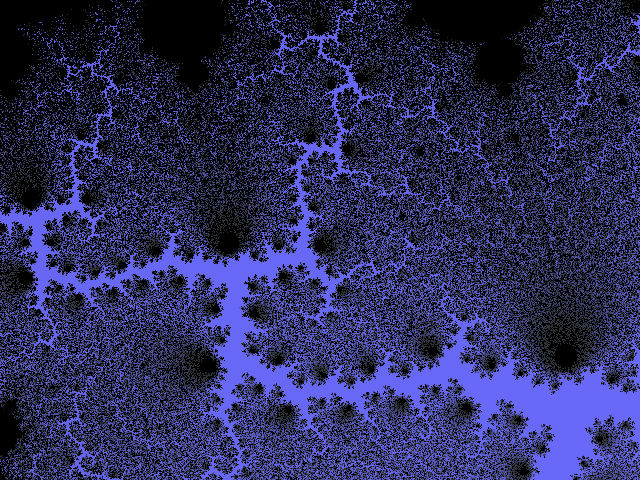 More than other art-forms, fractals tend to benefit most from decent anti-aliasing. What I've found out over the past couple of days is how much processor time is needed to obtain really smooth results. I used to double the width and height of each image and downsample to the proper resolution. This does indeed definitely help the image look more fluid than usual. However, it turns out that sampling 8x8, 16x16 or even as much as 32x32 per pixel (i.e. 1024 times slower!!!) for many images will produce much crisper results. Few fractals demonstrate this better than this ultra-fine sponge texture (still from the standard Mandelbrot) which I have rendered versions of below for comparison. Here we have the same image but downsampled from 1280*960 back to 640*480. Already, it's looking much better. But can you notice the noisy artifacts? Can we improve on this? The longest I was willing to wait (and the maximum size my PC could handle is this whopping 10240*7680 resolution image downscaled to 640*480. All the details shine through, and noise is at its lowest. What downsampling scales do users here use for generating their fractal images out of interest? hey, great examples, good work, the difference from the first to the last image is astonishing! excellent renders is that level of zooming achievable with double precision floats? is that level of zooming achievable with double precision floats? I think so yes. It's 1.0e-7 per pixel for the 640*480 version, so for the massive 10,240 pixel version it's still only up to 6.0e-9 per pixel. I'm guessing that whatever anti-alias method you use, the (initial) resolution will be a more significant factor in determining final image quality.